I’ve been in a reflective sort of mood the last few days after a visit from someone I haven’t seen in some time. Seeing this person stirred up a storm of emotion, good, bad, and everything in between. I’ve been trying to move past some uncomfortable feelings about a situation in which I no longer have any control. I’ve been desperately clinging to past hopes and dreams, while the universe is now the one leading the charge. It’s unfair and unkind and many ways, but it just is and I have to find a way to be okay with it. I got a big smile on my face the other day when a friend commented about “oversharing”. One may think it’s a bad thing, that it may paint one in an unflattering light, I on the other hand think that when done in a positive way is the occasional antidote. It means you are human and working on the constant chaos that swirls around all of us also known as life. I know when I see things clear as day I dislike in myself it means I can also see that I need them to change. Change is uncomfortable but change makes us grow. I look forward to the written word and it’s power to stir me, I beg of you; make me feel happy, sad, perplexed, curious, enraged, for goodness sake make me feel something, don’t let the opportunity go to waste. We all have an opportunity to make a difference even if it’s the smallest one. I think that is why I found myself drawn back to this space. Even if it doesn’t make a difference in anyone else’s life it makes a difference in mine, it grounds me back to making a little sense out of a world that seems senseless most of the time. I happen to believe change isn’t just possible, but probable, an eventuality, a response to our being open to the universe and its offerings. I’m working on opening my mind to new things, changing the direction I’ve been pointed, it’s a process but if anything comes too easily, it’s probably time to up your game. 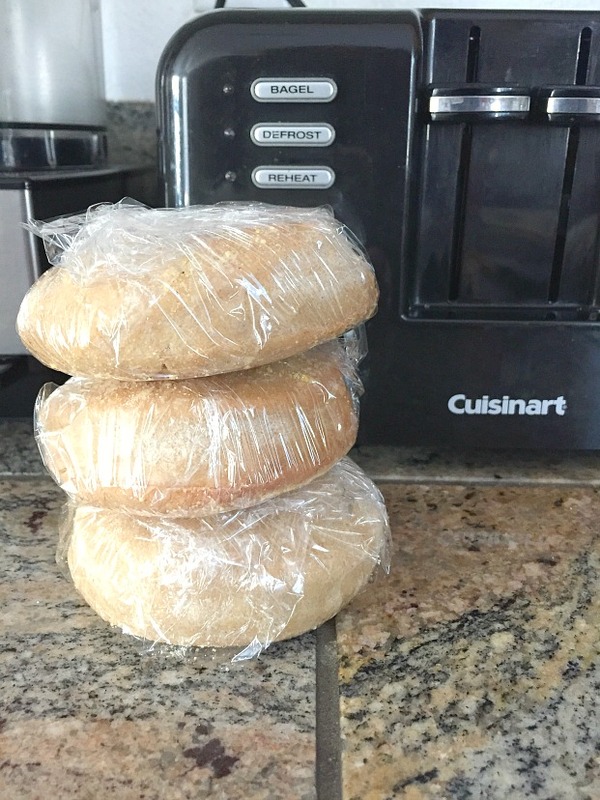 I wasn’t too excited about my first experience making English muffins; actually they weren’t at all what I hoped for. With a little perseverance and quite a few more tries I did finally land on a version that makes me smile from the inside out. I’ve been making a ritual out of baking these every few weeks now for the last few months, and one I don’t plan on changing any time soon. The original recipe calls for frying the muffins in Ghee and after several experiments and lots of smoke alarms going off in my kitchen, I can now say baking them as I’ve instructed is my preferred method. 1. Make biga: 1 day before. Combine water, flour and yeast in a small bowl, cover tightly with plastic wrap and refrigerate for 12-24 hours. I often forget to make the biga the night before, so if you desire to make the muffins same day, leave the prepared biga on the counter in a warm spot for 2-3 hours and proceed with the recipe as follows. 2. Make dough: combine biga, water, yeast, olive oil, and salt in the bowl of a stand mixer. Affix the bowl to stand and add dough hook attachment and mix on low speed until combined. Or mix by hand. 3. Mix in flour to make soft dough that barely cleans the mixer. Knead on medium-low speed about 8 minutes. 4. Cover bowl with plastic wrap and let sit 2 hours. 5. 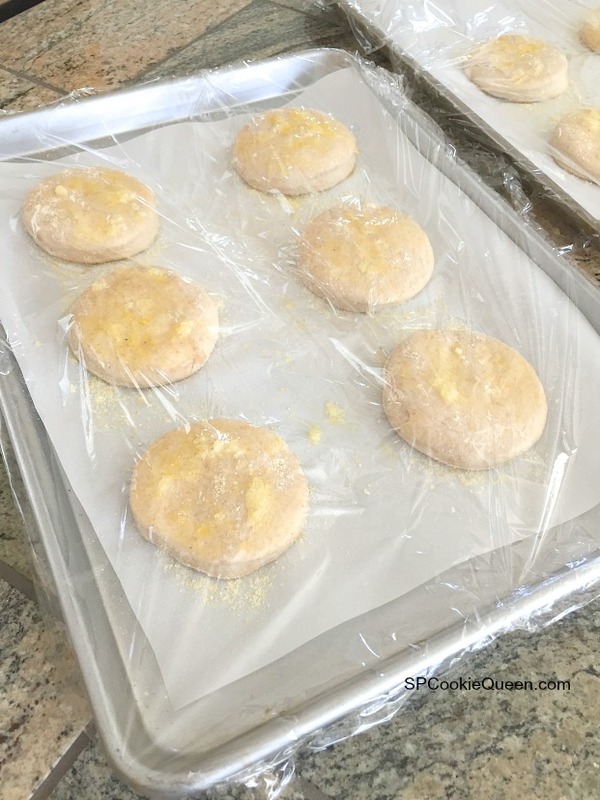 Line two baking sheets with parchment paper, brush with a little clarified butter and sprinkle lightly with cornmeal. 6. Using a silicone spatula scrape the dough out of the bowl onto a lightly floured work surface. Roll dough out with a rolling pin into a circle about 3/4-inch thick. 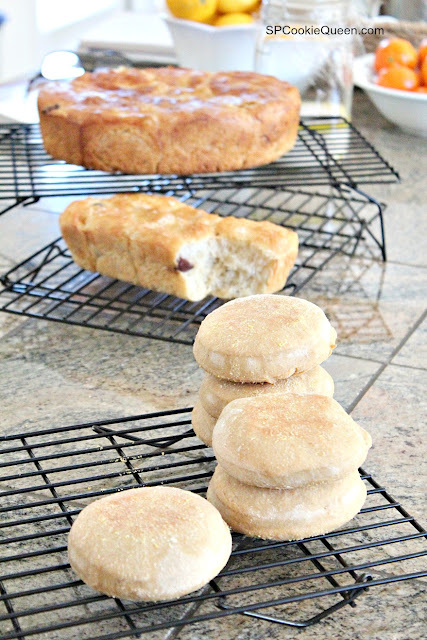 Cut the dough with a 4-inch round cutter and place 6 muffins per baking sheet. Reroll scraps and cut as many as you can get. Sprinkle cornmeal on the top of the rounds. Loosely cover the pans with wrap. Let stand until the rounds have increased by half, about 1 hour. 7. Preheat oven to 410 degrees F. Drizzle the top of the muffins with a little of the clarified butter. Place one sheet at a time on center rack and cook for 8 minutes, carefully flip the muffins, and drizzle with a little more clarified butter. Cook 8 minutes longer. Cook second tray the same way and let cool completely on cooling rack. 8. To serve, slice muffins in half and lightly toast. A good way to store the muffins is individually wrapped in plastic wrap and if you have more than you think you will eat in 2 days put the remainder in the freezer. Makes 10-12 muffins depending on how thick you make them. 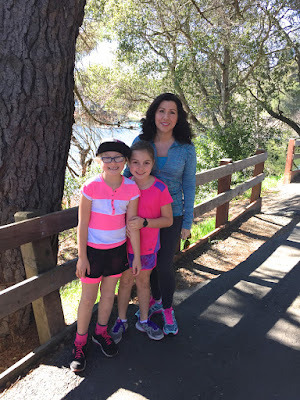 As for me I'm enjoying this spring, its fickle nature, and some smiling faces I adore. I'm also reminding myself, it's an evolution; not a revolution. wow Gina, you are glowing and looking super fit!! It must have been more than a decade since I last baked some English muffins. Frying the muffins in Ghee...that doesn't sound like a traditional English muffin. I love your baked version. 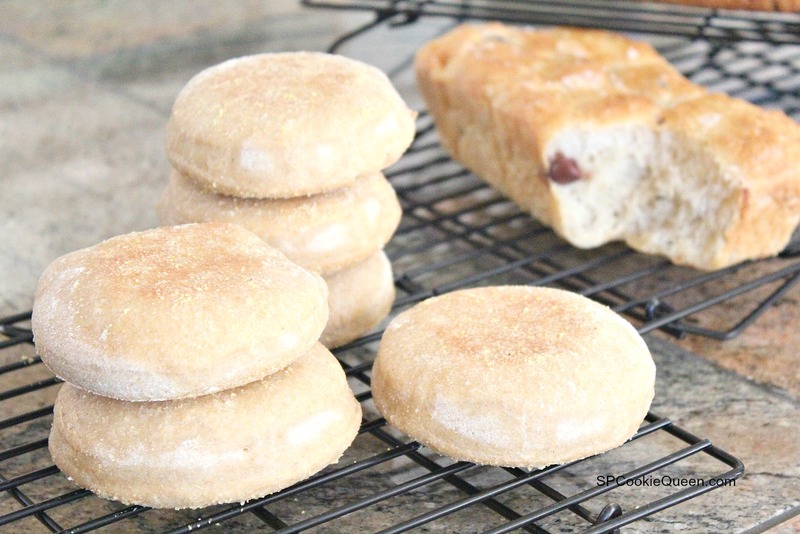 What gorgeous English muffins! I'd love one on this rainy afternoon with my coffee! These look even better than Model Bakery's!!! I've been wanting to try theirs forever and this post makes me want to try the ones you made. I bet they'd be fantastic with jam! PS: Glad you're writing again, friend!